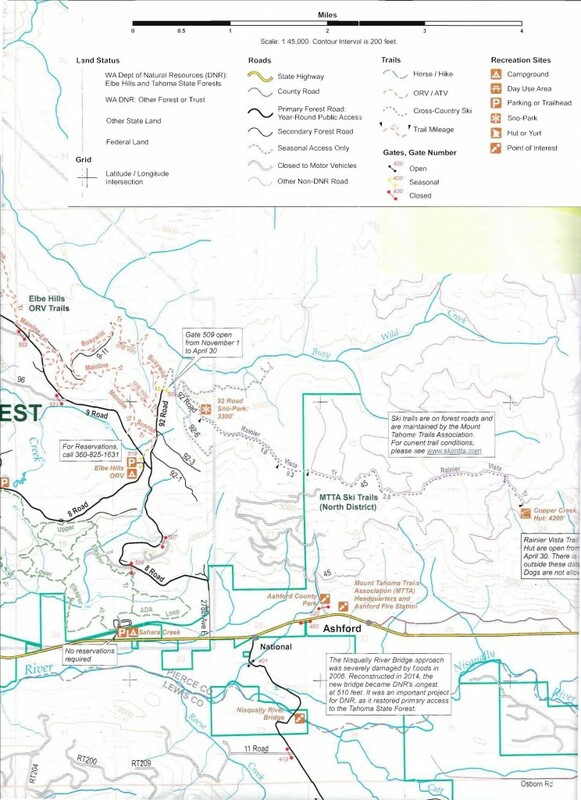 Maps: A map with detailed information about the trail system was published in 2001 and copies of the map can be obtained from the MTTA office (open from 9 am to 5 pm on weekends during winter season only) or from Whittaker Mountaineering in Ashford. Please keep in mind that some of the ski trails and sno-park access locations shown on the 2001 map are no longer in use. 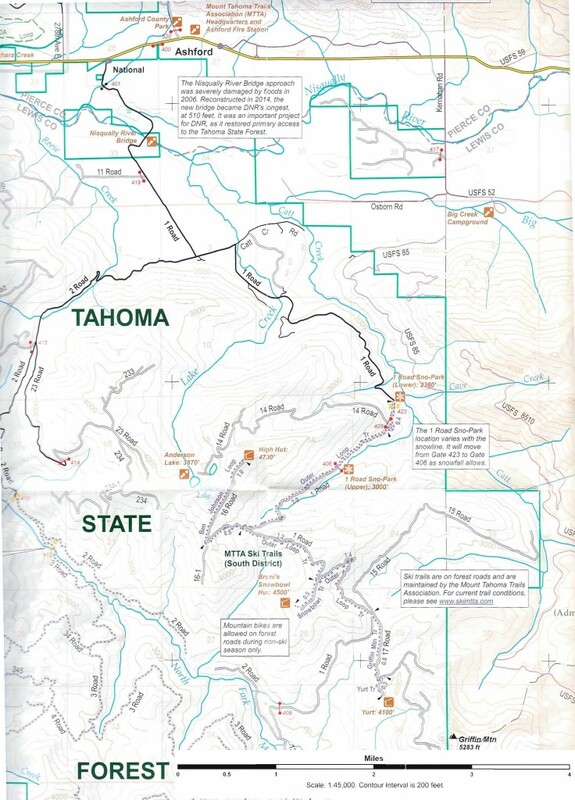 The Washington State Department of Natural Resources published a recreation map for Elbe Hills and Tahoma State Forests in 2015 that includes the MTTA trail system as currently in use. The map can be purchased here. 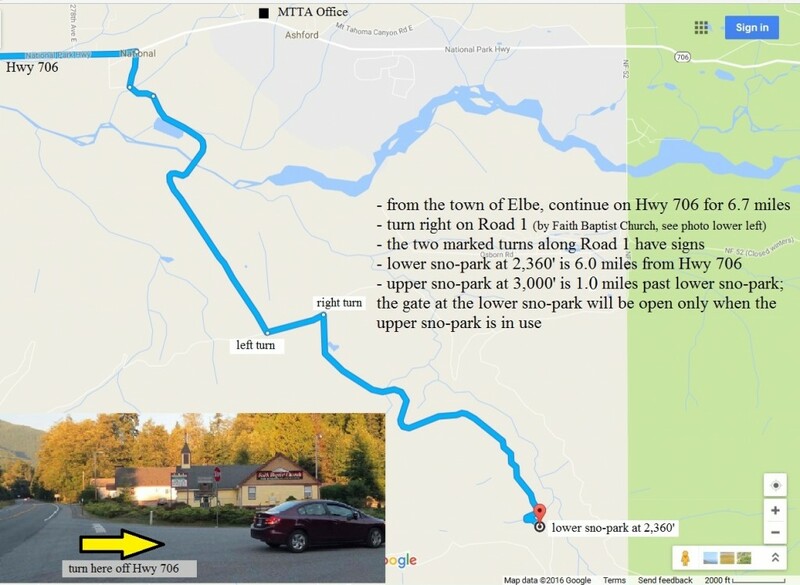 For your convenience, the MTTA trails as shown on the map can be previewed here: North District trails and South District trails. Directions to South District/High Hut, Snow Bowl Hut, Yurt: We use two sno-parks in our South District, a lower sno-park located at an elevation of 2,360′ and an upper sno-park at an elevation of 3,000′. Typically the lower sno-park is in use; we use the upper sno-park when the snow level is at or above 3,000′. A map with directions to our South District sno-parks can be viewed here. Directions to North District/Copper Creek Hut: We have three sno-parks available for use in our North District, a lower sno-park located at an elevation of 2,560′, a middle sno-park at an elevation of 2,960′ (least frequently used) and an upper sno-park at an elevation of 3,160′. The lower or upper sno-parks are most often in use depending on the snow level; Copper Creek Hut is closed during the summer season. 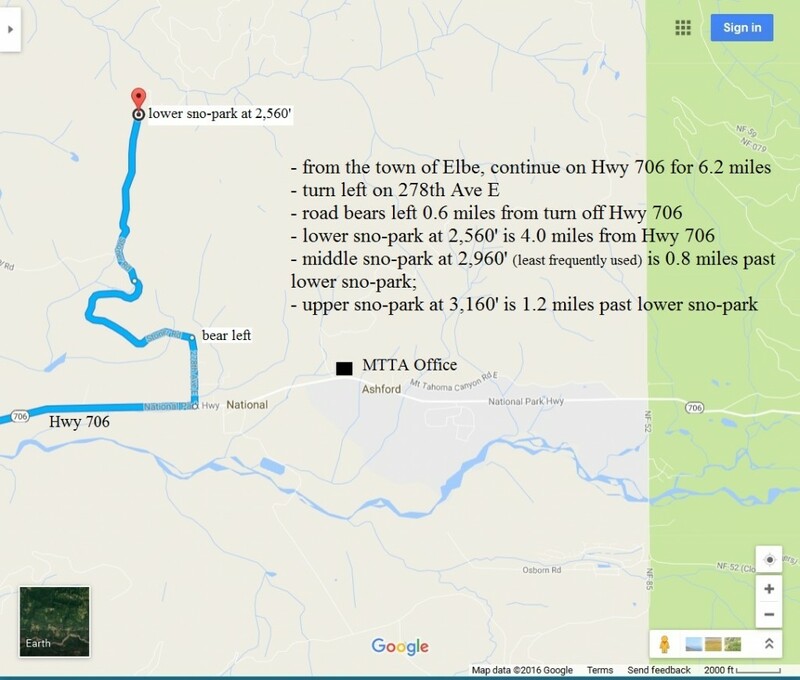 A map with directions to our North District sno-parks can be viewed here.